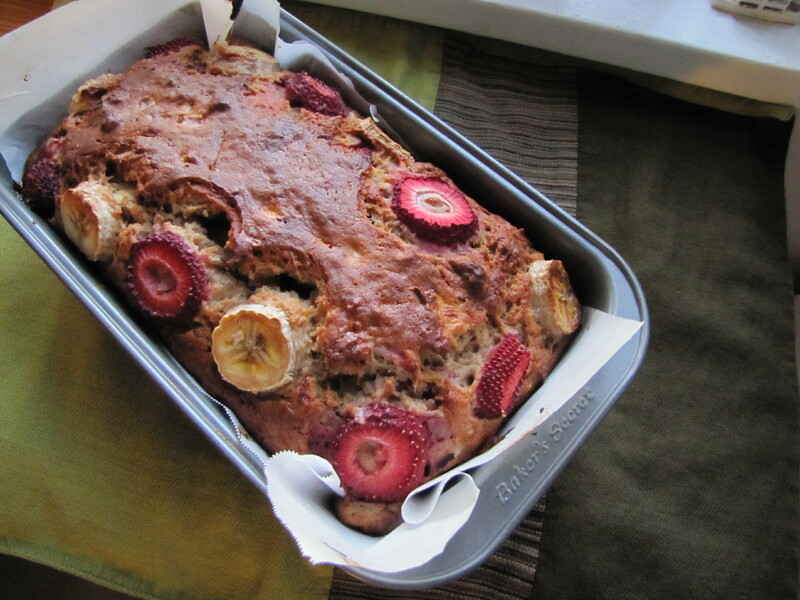 Strawberry Banana Bread – Voila! Starting today through the rest of August I’ll be on hiatus. My graduate program just ended, we’re in and out of town and the biggest news of all is…we’re moving! I got at job at the North Carolina Museum of Art and we’re hoping to find a place in Durham. I love this blog, but I just ain’t got the time! I am really looking forward to exploring the culinary options in Durham and the Triangle area. Already we had an amazing panini at Toast on Main Street. Looking forward to more foodie adventures! For now, satiate your appetite with this delicious quick bread! 3 very ripe, soft bananas, mashed well. Save 1/2 of banana for garnish. 2. Whisk together flour, sugar, baking soda, salt, cinnamon and walnuts in large bowl. Set side. 3. Mix mashed bananas, yogurt, eggs, butter and vanilla in a medium bowl. Lightly fold in banana mixture into flour mix until just combined. Gently fold in strawberries. Batter will look thick and chunky. 4. Scrape batter into prepare pan. Slice remaining 1/2 banana and strawberry into thin slices. Place slices on top of batter in alternating pattern. 5. Bake until loaf is golden brown and a toothpick inserted comes out clean, 50-55 minutes. Let cool for 5 minutes before transferring to a wire rack.